Attend the Best Brands Pre-Show Training session for your chance to win big! Need another reason to attend the Best Brands Pre-Show Training? How about three big incentives! Not only will you learn about the Best Brands and exciting programs available (see full course description below), but you also will have a chance to win one of three great items. 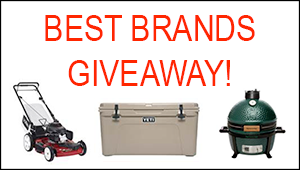 We’ll be giving away a Toro Mower ($369.99 value), a Yeti Tundra 75 ($449.99 value) and a Big Green Egg MiniMax ($599.99 value). Register today and sign up for the March 15th Pre-Show Training. Then attend Session E, “Best Brands and How to Bring Them into Your Store,” from 2:30–4 p.m. Session Description: Do you carry the brands that customers want and are looking for? Are you the first place customers think of when it comes to grilling and outdoor power? Make sure you are doing everything possible to help differentiate yourself from other retailers. We will cover who the Best Brands are and why they are so important to you. We’ll talk about the programs available, making it a “no brainer” to have these brands for your customers to purchase. You’ll learn how to order and utilize the resources available from the vendors and how to see examples of what it could look like in your store.